Rich people often target their philanthropic donations in the direction of other rich people. Warren Buffett gives billions to Bill Gates; Reid Hoffman gives millions to Mark Zuckerberg. When it’s done well (and Buffett has done it well), this can be an extremely effective exercise in allocative efficiency. Giving away very large sums of money is difficult, after all, and some people are better at it than others. Gates has proved, at this point, that he knows what he’s doing; Buffett has no inclination to join him on that learning curve; so instead he has effectively outsourced his philanthropy to the Gates Foundation. What’s more, Buffett knows that in terms of comparative advantage, he is the investor while Gates is the grant-maker. So Buffett makes sure that Gates doesn’t invest any of his money inside the Gates Foundation endowment, and has to give away all the money he receives from Buffett every year. Smart. The Hoffman donation I’m less excited about, just because the Chan-Zuckerberg philanthropy is as yet unproven. Hoffman’s announcement of his donation is full of vague nothings: the headline is “Symbiosis with the Biohub,” and he goes on to use lots of words like “strategic” and “leverage” and “computational”. All of this verbiage has grown out of what Hoffman describes as “many conversations with Mark Zuckerberg and Priscilla Chan” over the past few years, and while I’m sure that talking about such medicine with the Chan-Zuckerbergs makes for a lovely date night, I’m not at all sure that Mark and Priscilla are yet real experts in the fraught world of medical philanthropy. The Chan-Zuckerberg Initiative is in its very early days, and its processes and outcomes are as yet entirely unproven. Hoffman says that he’s “pretty good at this kind of capital allocation,” and he might be right about that, although I don’t share his confidence that people who are good at capital allocation in the realm of early-stage technology companies are, mutatis mutandis, also going to also be good at capital allocation in the realm of philanthropy. In fact, if I were being cynical about this, I would look at Hoffman’s donation and say that it was a sign that Reid is worried about CZI being ineffective, and feels, like the venture capitalist he is, that the best way to make sure that this organization achieves its potential is to buy himself a board seat and make sure that Zuckerberg’s money doesn’t end up utterly wasted. In that sense, throwing $20 million into a $600 million pot can be a very smart investment: for a relatively small up-front price, Hoffman can help to set the course for something which is going to become a philanthropic supertanker in the coming years. Still, all of these individuals – Bill and Melinda Gates, Warren Buffett, Mark Zuckerberg, Priscilla Chan, Reid Hoffman – are grappling seriously with the profoundly important questions of when, where, and how to put their money to its best philanthropic purpose. And in that they are far from typical. Most of the time, when rich people give their money to other rich people’s charities, they do so in a far more self-centered and transactional manner. Which brings me, finally, to the Eric Trump Foundation, now under investigation by New York’s attorney general. This maneuver would appear to have more in common with a drug cartel’s money-laundering operation than a charity’s best-practices textbook. That $100,000 in outside donations to the Donald J. Trump Foundation (remember: Trump himself didn’t give to his own foundation at this time) passed through the Eric Trump Foundation—and wound up in the coffers of Donald Trump’s private businesses. This is a particularly egregious example of something which happens every day: transactional philanthropy, or the way in which people give money to a certain charity only if they get something they personally desire in return. Donald Trump, it seems, rapidly realized that he didn’t need to funnel his own foundation’s money into the Eric Trump Foundation in order to get his son’s foundation to start writing six-figure checks to the Trump Organization. Instead, he packed the Eric Trump Foundation board with Trump Organization cronies, ousting Eric Trump’s childhood friends along the way, and then steadily increased the amount of money that the foundation paid the Trump Organization each year. The $100,000 in 2011 was just the beginning: by 2015, the Eric Trump Foundation paid the Trump Organization an eye-watering $322,000 – much more than the open-market value for services rendered. Meanwhile, the Eric Trump Foundation kept on bringing in millions of dollars, most of which ended up being passed through to the St Jude Children’s Research Hospital in Memphis. 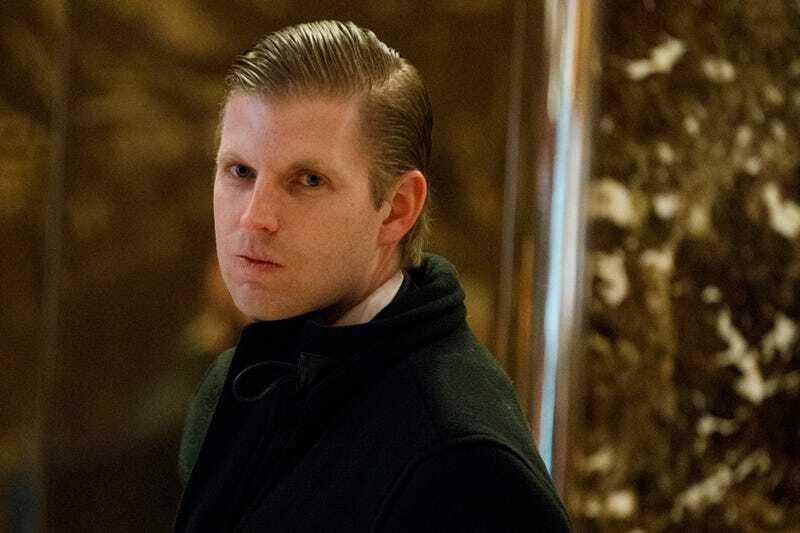 To a first approximation, none of that money came from the Trump family – and yet today, if you visit St Jude, you’ll find an intensive care unit with Eric Trump’s name on it. That ICU is a classic example of transactional philanthropy: the quid (having the Trump name on the door) came in response to the pro quo of Eric Trump promising to donate $20 million to St Jude over the course of 10 years. Which, incidentally, now looks ike it’s not going to happen: pledges are all well and good, but when they come from people like Eric Trump or Alberto Vilar, they can end up failing to materialize. So where did all those millions come from? It wasn’t from people who were particularly exercised about the cause of pediatric cancer – after all, those people could just have given their money to St Jude directly, without getting Eric Trump to do their giving for them. Instead, the money came from another quid pro quo: in return for writing large checks to the Eric Trump Foundation, rich people would ingratiate themselves with the Trump Organization and get to play golf and have dinner in luxurious surroundings. The primary beneficiary of their money – St Jude – was clearly chosen not so much because it needed the cash (Eric Trump says he’s “not really sure” why he’s giving to St Jude rather than anybody else), but rather because it’s an entirely inoffensive cause, a household name which no one’s going to feel any need or desire to second-guess. That said, there were secondary beneficiaries of the Eric Trump Foundation, all of which were much more clearly transactional. In one case, the American Society for Enology & Viticulture ended up with a $1,600 check while Eric Trump walked away with a copper wine still and an antique bottle washer. This is the difference between the 1% and the 0.01%: While the 1% might spend $1,600 of their own money on a copper wine still, the 0.01% spend $1,600 of money which was donated by other people to their personal foundation. As Forbes’s Alexander notes, all of this unedifying favor-currying did have significant positive outcomes, in the form of millions of dollars flowing to St Jude’s. That might not be the most efficient philanthropic destination in the world, but it’s still a good cause which has clearly benefitted from its relationship with the Eric Trump Foundation. In a weird way, Eric Trump is a good charity fundraiser precisely because he so intuitively understands the venality of the rich. He could have asked his rich friends to donate money to St Jude’s, and some of them would have done so. Ultimately, however, the amount he could have raised that way would have been a fraction of the amount he managed to aggregate by throwing a series of glamorous golf-course parties. Such events make effective-altruism types grimace, but they are effective in their own way. Money is fungible, and charities can do as much good with tainted money as they can with the noblest of donations. That, in turn, means that there’s a strong incentive for philanthropic types to look the other way when money arrives for bad or ugly reasons. So there’s no reason to blame St Jude’s for anything, here. But the rest of us have no reason at all to give the ulterior-motive donors a pass. Everybody associated with the Eric Trump Foundation, including the people who attended its parties, was involved in an extremely skeevy scheme. The good news, I guess, is that thanks to the current salience of the Trump name, prosecutors are now getting involved. Political success can, it turns out, have negative consequences.